Achilles Tendonitis can be caused by tight calf muscles, increased activity over and above what you were doing previously, or wearing incorrect unsupportive shoes. Firstly we suggest you go and see a podiatrist or foot health practitioner for advice – we recommend visiting www.feetforlife.org for more information on finding your local registered practitioner. Trainers without support place strain on the Achilles tendon which in turn can place strain on the underneath of the heel, arch and ball of the foot. Cushioned heels lifts will provide cushioning against impact but also relieve some of the strain on the Achilles and thus the foot. You may also want to get a gait analysis carried out to see if you need orthotics. Blisters they are caused by excessive friction or pressure over a certain area of your foot. A blister will form where the skin is being pinched and rubbed, for example between tight fitting shoes and your skin. They can be caused by heat and moisture as well as pressure. If you are prone to blisters, you could look to prevent them by protecting those areas in advance. You could use a spray such as Flexitol Blistop for your feet or a anti-chafing gel such as our Akileine Sport NOK for your legs. 3. Rachel Butcher – I’ve got a really painful blister on my toe after a long run yesterday, should I pop it or leave it? Our suggestion would be to leave it. Sometimes they can “pop” by themselves and become infected. A large blister is typically larger than 5mm across. Keep the area clean and protected, and also remove the source of the problem eg. tight shoes. Soak the foot in a mixture of water and Epsom salts. If the blister does “break” don’t take the top layer of skin off, but keep it on to protect the area. Then use a suitable dressing to keep the area clean and padded. 4. Donna Healy – Bruised toe nails! Bruised toe nails are a common running condition usually caused by the constant contact of the toe hitting the front of the trainers. This repetitive movement causes bruised blood vessels and blood blisters usually found on the big toes which give this black appearance. The most common cause is trainers that are too small so correct size and fit is usually the best option or prevent it by protecting the toe with something like a gel toe cap. Make sure you have the right running shoe that fits properly (it should be one cm longer than your longest toe) and replace it regularly. If the areas remain swollen and painful, we recommend going to see your podiatrist. 5. Allyson Chorlton – Very sore/tight Achilles but only on the right ankle! The Achilles tendon connects the heel of the foot to the calf muscles, and is the strongest tendon in your body. These problems occur at the back of the foot where you will feel a sharp, constant pain when you walk or run, just above your heel. It can be caused by wearing incorrect unsupportive shoes, pronation where your feet roll inwards or leg length discrepancy where one leg is longer than the other. As you only suffer in one leg, you may require a more detailed assessment so get a gait analysis carried out to see if you need orthotics. We suggest you go and see a podiatrist or foot health practitioner for advice. 6. Katy Downes – how about bruised toenails that will eventually drop off! Eeeughh!! As we earlier explained, bruised toe nails are an extremely common running condition which is usually caused by repeated contact of the toe hitting the front of the trainers. This movement causes bruised blood vessels and blood blisters usually found on the big toes which give this black appearance. If the area remains swollen and painful, go and see your podiatrist. If the pain is not severe the nail will eventually fall off and be replaced by a new nail. 7. Yvonne Brown – I suffer with the bottom of my heel it constantly hurts me! This is probably the most common foot complaint for runners. The heel is the part of the foot that strikes the ground first when you walk. Pain in this area is as a result of two major causes – the presence of a heel spur, or the condition known as plantar fasciitis. “Flat Feet” are the main reason for this – because the feet “roll inwards” on standing or walking, the strip of ligament (the facia) that starts in your heel and stretches forwards to your toes is overworked. So when this is happening – and it happens with very single step – where the facia insets into the heel becomes inflamed and painful. Try and take the pressure off the foot as much as possible. Try and buy as good quality shoe as you can – you need support along the inside of your foot, so something like our FS6 foot sleeve would be suitable for this. Orthotics will help realign your feet (stop the “rolling inwards”) and allow the pressure you feel as you stand to be directed towards the outside of your feet where it should be felt. Wearing cushioned heel supports and padding will help, we recommend the popular Dual Gel heel cushions to support and comfort. 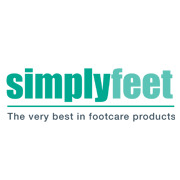 COMPETITION – We have some Simply Feet products to give away to one lucky person that will be picked at random, all you have to do is answer the following question correctly to be in with a chance. Blisters – The Bane of Every Runners Life!